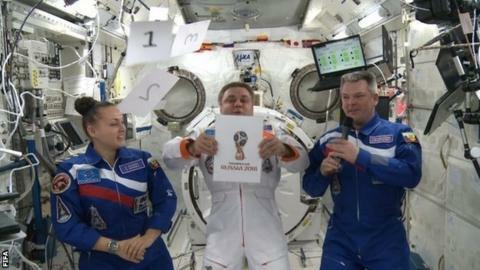 The emblem for the 2018 Fifa World Cup in Russia has been revealed on board the International Space Station. The design was inspired by "Russia's rich artistic tradition and its history of achievement and innovation". The image of the emblem was also projected onto the Bolshoi Theatre in Moscow. Russia won the right to host the tournament for the first time after beating England, Spain-Portugal and Netherlands-Belgium in a 2010 vote.